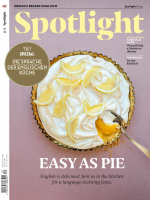 Ein Jahr lang hat unser Autor als Austauschstudent in Deutschland gelebt und auch als Praktikant beim Spotlight Verlag gearbeitet. Jetzt ist er wieder zu Hause in Puerto Rico und berichtet aus dem krisengeschüttelten US-amerikanischen Außengebiet. Four lanes of pure darkness. That’s how Piñero Avenue looks as we drive along it from the airport to my house in Río Piedras, which is in San Juan, the capital of Puerto Rico. I’ve just returned home from living in Germany for a year. Cristina Vélez, my good friend, takes her eyes off the road and to glanceblickenglances my way. “Many streets look like this after Maria,” she says, referring to the hurricane that struck the island in September 2017. Her face, which used to be full of life, now looks tired. I know this last year has been hard for her, as well as for many Puerto Ricans. They to endureerleiden, ertragenendured two big hurricanes, one after the other, which left many homeless and without a job. They saw friends and family join the massive exodus to the mainland US. And they suffered the deaths of many after the storms. “You’ll get used to it, to the brokenness of it all,” she tells me, without a glance this time. Difficulty is nothing new for us Puerto Ricans. A fragile economy, big austerity measuresSparmaßnahmenausterity measures, massive emigration, a decrepitheruntergekommendecrepit healthcare system, and many other hardshipNot, Entbehrunghardships have to burdenbelastenburdened us all these past few years. To get a better understanding of how things are going, I decide to travel around the island and talk to people. My first stop is Rincón, a municipalityStadt; Gemeindemunicipality famous for its beaches, located on the west coast of the island. It’s about a two-hour drive from my house, and a place I cherishlieb und teuer seincherish. I heard it had recovered well and I want to collect some data on that, so I go to the Muni­cipal Emergency and Disaster Management Office. At the small reception, I meet Edgardo Ruiz, 30. “Right now, the numbers guy isn’t here, but how about I show you around Atalaya and you can see for yourself?” he asks me. I accept his offer with the reluctanceWiderwillenreluctance of a city boy faced with authentic generosityGroßzügigkeitgenerosity. Atalaya is a ruralländlichrural part of Rincón that faced many problems after Maria. We get in Edgardo’s old white Ford Explorer and drive toward the mountain. “Many of these houses have brand-new roofs,” he says as he slows down and points to a group of houses on the mountainside. I see some zinc roofs, and a few blue tarp(Zelt)Planetarps. These blue tarps were provisional covering for houses that lost their roofs due to the hurricane. They were distributed around the island by the Federal Emergency Management Agency (FEMA), which organizes help after a big disaster occurs in the United States. Edgardo keeps driving deep into the mountain for what feels like a long time. Most houses are all right, some are destroyed; others are in good shape but abandoned. “They just packed up and got out of to get out of Dodge (ifml.)abhauenDodge. Even left the light on and everything,” he says with a chuckleleises Lachenchuckle. I ask him how it was in other rural parts of the island. I thank him as he drops me off at the town plaza. Most businesses appear to be running still. I go into a cafe-restaurant with a surfer vibe (ifml. )hier: Stil, Touchvibe to it, typical of the area, and start up a conversation with the barista. Next, I go to Barrio Obrero, one of the most severelyschwer, starkseverely damaged neighborhoods in the capital city of San Juan. It is full of life. There are grocer’s shopLebensmittelgeschäftgrocer’s shops with bunchBüschelbunches of plantainKochbanane-plantains hanging in the entrances, bachataBachata (eine aus der Dominikanischen Republik stammende Musikrichtung)bachata blastdröhnenblasting from pimped out (ifml. )aufgemotztpimped out cars going by, and many houses to squeezequetschensqueezed together. Some still have blue roofs. I see people sitting on chairs in front of a bar, so I head over. At first, they’re to be dismissive of sth.etw. abtundismissive of my questions regarding the current state of the island but, in the end, they talk. In 2016, the federal government imposed on Puerto Rico a board composed of seven members with enormous powers. The purpose of the financial oversight board is to dictate our government’s budget and to oversee the payment of our $74 billionMilliarde(n)billion debtSchuldendebt, a disastrous amount for an economy of our size. So far, it has shown no significant initiative to promote local businesses or strengthen the local economy. The official count of those who died in Hurricane Maria in September 2017 was, for a long time, 64; they recently changed it to 2,975. A study in The New England Journal of Medicine put the death tollZahl der Todesopferdeath toll at 4,645. What angered people here the most is that the majority of those people died as an indirect cause of the hurricane. Many diabetics could not receive their insulin due to the lackFehlen, Mangellack of essential medical supplies. Those who relied on oxygen concentrators could not use them because there was no electricity. And there were many similar cases. After Manuel lists some more reasons, there’s silence; then everyone goes back to their own conversations. I ask him what he thinks about the rising concern of mental health on the island. A few days later, I go to see Luis Calderón, an entrepreneurUnternehmerentrepreneur who runs a commissary kitchen called Cucina135, in a district of the capital called Hato Rey. He receives me with a smile and leads me to the back, where we sit on the wooden deckVerandadeck. I ask him how this works. He tells me that local bakers or chefs make their products in his kitchen to then sell at various locations on the island. This supports the local economy. Luis also offers his facilityEinrichtungfacilities for culinary workshops or for meetings of community organizations. “A little bit [like] it was after Maria,” he adds. “What did you guys do here after the hurricane?” I ask. He tells me that three months after Maria struck, the place became a community hubKnotenpunkthub. They had about 15 regular volunteerFreiwillige(r)volunteers who, together with occasional volunteers, regularly delivered supplies across the island. “I also had a landlineFestnetzanschlusslandline, solar panels, running water, and filters. So people came here to make their calls, recharge their phones, fill their water bottles, and also just to get news about what was happening since there were many people coming and going,” he says. After my meeting with Luis, I walk back to my house. I see in him a lot of optimism and confidence in himself and in Puerto Ricans in general. He knows that we are able to stick together in times of catastrophe, and that there are people here who are trying to improve conditions on the island. From what I’ve seen and heard, Puerto Rico still has a long way to go in the recuperationErholungs-recuperation process of its economy, its infrastructure, and its people. The government, local and federal, is offering only lukewarmlauwarm, halbherziglukewarm support. But there is still hope, and it lies in Puerto Ricans themselves.